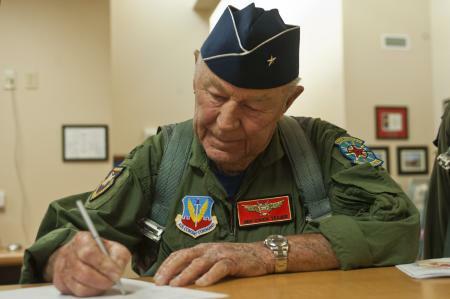 While Austrian skydiver Felix Baumgartner was jumping from balloons and falling at 830 MPH, aeronautical legend Chuck Yeager retraced history by breaking the sound barrier at 89 years old, and, uh yes, while wearing a Rolex just like he did on his first flight in 1947. 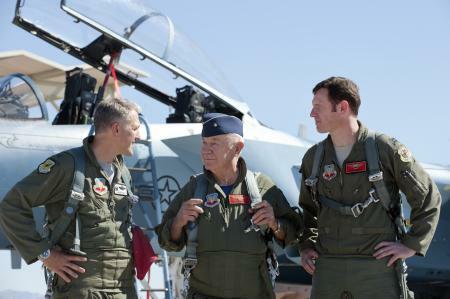 The commemorative flight recreated the 1947 flight but flown in a modern day F15 fighter jet at an altitude lower than when Yeager was dropped from a B-29 bomber. Shuttling the Bell X1 jet to 45,000 feet on the underside of a bomber was the only way they could reach the thin altitude that enabled the jet to fly beyond Mach 1. According to Yeager, it gave the U.S. a five year leap in aviation advancement at a time when the cold war was just germinating. Despite the differences between the two flights, one thing remains the same. Yeager wore a trusty Rolex. Pictured in the commemorative flight, Yeager wore what appears to be a modern white gold bezeled DateJust with a polished center link bracelet. 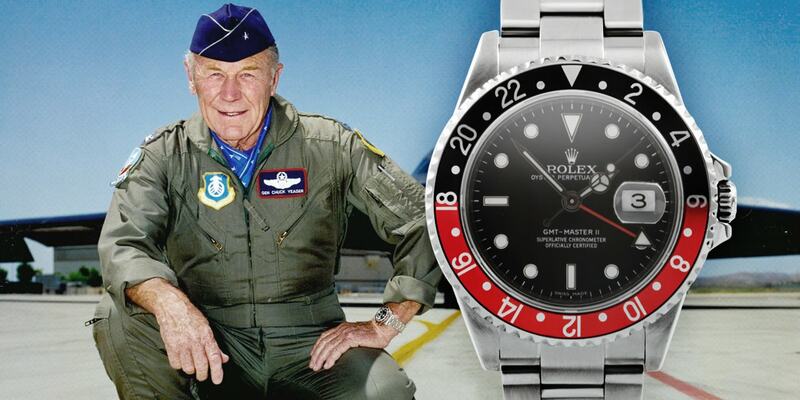 Throughout his career, Yeager has been pictured wearing a Rolex Oyster during his fabled X-1 flight, a big crown Submariner, a 16710 GMT Master II (red/black), and now a DateJust. The Rolex Oyster worn in Yeager’s 1947 flight is now in Rolex’s private collection in Geneva. As a result of Brigadier General Yeager’s accomplishments, he is a Rolex Ambassador and featured in numerous Rolex advertisements and the Rolex website. Despite Yeager’s association with Rolex, there is no question that Yeager picked Rolex before Rolex picked him. Numerous other aeronautical explorers and astronauts such as Jack Swigert, Ronald Evans, Leroy Chaio, Jim Lovell, Walt Schirra, Scott Carpenter, Ed Mitchell, Alan Sheppard as well as others selected Rolex as their go to watch . A fantastic chronicle of General Yeager’s accomplishments as well as other supersonic explorers is found on Jake’s Rolex Magazine. A thanks to Jake for researching and publishing Rolex’s provenance in flight exploration. 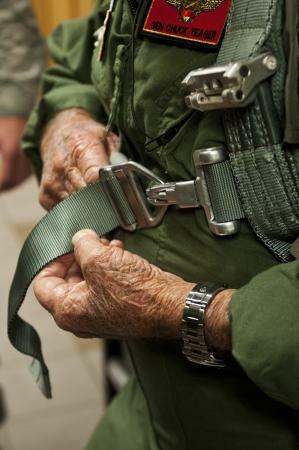 More images of Yeager’s commemorative flight can be found here.